Over the past decade, the UAE has been increasingly projecting its power west toward the African continent. Until recently, this deployment had gone relatively unnoticed. In March 2015, however, Abu Dhabi joined Riyadh in its military intervention in Yemen. The surprisingly large military capacities displayed by the UAE, in comparison with its relatively small size, have contributed to calling into question the relevance of the ‘small state theory’ put forward by some international relations schools of thoughts. Robert Mason asserts that Abu Dhabi “has been able to break the mold of small state classification” (Mason, 21 March 2018). While the UAE had built its reputation on being a regional financial centre and an international business hub, it is now a military power on the rise within an increasingly militarised region. This has earned it the nickname of “Little Sparta”, coined by a number of US generals, including James Mattis, current US Secretary of Defense and former Commander of US forces in the Middle East (The Washington Post, 9 November 2014). As the UAE expands economically, it has increasingly found itself engaged in a complex security environment, and has responded by engaging militarily, providing training, equipment, and direct battle assistance in Yemen and the East African Horn. This is likely due to “the importance of the Red Sea as a vital artery for the transportation of the country’s hydrocarbon exports” (Reuters, 27 August 2018). Yet, as it seeks to assert its influence on this vital passageway, it appears that Abu Dhabi has increasingly found itself involved in a set of incredibly messy political affairs and complicated conflicts that have reached disastrous levels. The Yemeni Civil War, for instance, has resulted in the worst humanitarian crisis in the world, and it is unlikely to end any time soon as various actors’ alliances fragment and reshuffle (CNN, 3 April 2018). The Houthis and Al-Qaeda in the Arabian Peninsula (AQAP) have both proven to be deeply entrenched, and the war is now stretching into its fourth year, far beyond what the Saudi-led coalition could have imagined. Seemingly impatient with the slow progress of the war, the UAE has increased military support for a number of anti-Houthi militias as part of the assault on the port city of Hodeidah, creating a tangled web of alliances that could contribute to further serious instability within the country in the form of faction infighting. Similarly, divisions over the diplomatic row with Qatar since June 2017 have led the UAE to step up support for various Somali factions and Somalia’s federal states, leading to a “dangerous new twist to Somalia’s instability” (Crisis Group, 5 June 2018). Overall, it appears that the UAE is willing to engage economically and militarily within the regions it seeks to influence, a tactic that could contribute to further state instability and weakness in Yemen and East Africa. Although the UAE has diversified its economy in a way that is yet unmatched by all other Arab countries of the Gulf, its prime source of revenue remains its oil. Despite a still increasing diversification process, analysts assess that “the UAE’s dependence on oil is a significant long-term challenge” (The World Factbook, September 2018). In this context, Abu Dhabi finds itself within the geography of three major chokepoints of the global oil trade: the Strait of Hormuz, the Bab al Mandab Strait and the Suez Canal (US Energy Information Administration, 4 August 2017). The UAE’s natural location gives it shared control, with Iran and Oman, over the Strait of Hormuz. The Suez Canal and the Bab al Mandab Strait, which secure the passage of oil between the Mediterranean Sea and the Indian Ocean, are located on the other side of the Peninsula. The Red Sea, the waterway located between these two chokepoints, hosts two-thirds of global maritime trade (Lavergne, May 2018). In addition to securing its own economic interests, Abu Dhabi’s projection on the opposite side of the Peninsula is also a way to position itself as one of the major players of international trade. To this effect, the Federation has created Dubai Port World in 2005, through the merger of Dubai Ports Authority and Dubai Ports International. The company has since become one of the world’s leading port operators, as well as “one of the instruments of [the UAE’s] global affirmation strategy” (Lavergne, May 2018). As of today, it is operating, and in some cases managing, the ports of Bossaso in Puntland, Berbera in Somaliland, Doraleh in Djibouti, Jeddah in Saudi Arabia, and Ain Sukhna in Egypt, located on the shore of the Gulf of Suez (see Figure 1 below). Although DP World is not officially operating the ports of Mukalla and Aden on the southern coast of Yemen, they are effectively controlled by the UAE (Reuters, 27 August 2018). Note that Bossaso is not directly operated by DP World, but that it is operated by P&O Ports, which was acquired by DP World in 2006. Abu Dhabi’s attempt to overly assert its influence in the port locations has sparked a wave of resistance in the form of nationalistic moves not unlike the one seen prior to the Suez Crisis of 1956 (Brittanica, 22 August 2018). On February 22, the Djiboutian government seized control of the Doraleh Container Terminal from DP World, which had been awarded the concession in 2006 (Maritime Executive, 10 September 2018). Somalia, likewise, “banned Dubai ports operator DP World from operating in Somalia, saying that a contract that the company signed last year with the breakaway Somaliland region to develop an economic zone is null and void” (Reuters, 13 March 2018). In Yemen, protests against the imposed UAE and Saudi presence are frequent in the south and the east of the country (ACLED, 16 May 2018). Figure 1 above provides an illustration of locations where Abu Dhabi has established its military forces, whether through official bases like in Bossaso and Berbera, or less formal implantations like in Mukalla and Aden, where it is operating the commercial ports. The UAE also possesses an official naval and air base in Assab, Eritrea, which has allowed it to deploy its forces with ease into neighbouring Yemen. Throughout the Yemeni conflict, Abu Dhabi has also exploited the security breakdown to build de facto bases in Perim Island, situated in the middle of the Bab al Mandab Strait, in the coastal city of Al Mukha, and in Hays city, located roughly 30 kilometres inland but with a road that has direct access to the coast. Within this context, one can only wonder if the current offensive led by UAE-backed forces on the port city of Hodeidah, on the Red Sea coast of Yemen, is not an attempt by Abu Dhabi at putting its hands on the last major Yemeni port not yet effectively under its control. The UAE’s Engagement in Yemen: There to Stay? 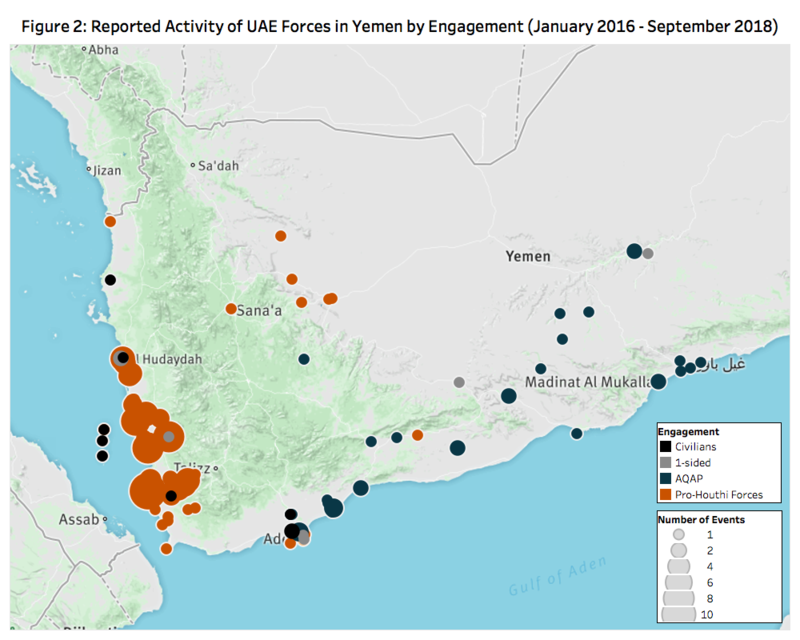 While the UAE remains economically interested in Yemen and the surrounding waterways, its engagement in the country is first and foremost military, with two distinct missions: to fight the Houthis on the one hand, and to fight AQAP on the other. The UAE says that it has trained 60,000 Yemeni soldiers, of which half are trained for counter-terrorism purposes (The Independent, 15 August 2018). This suggests that the UAE has equally divided its military efforts, training 30,000 soldiers for counter-terrorism, and 30,000 more for fighting the Houthis. Although they do not overlap, the UAE’s two missions in Yemen sometimes come in contradiction with each other, raising questions about the long-term repercussions of Abu Dhabi’s interventionism. Figure 2 below shows the engagement of the UAE in Yemen by the actor with which it engages. It acutely depicts the geographical separation of its two missions: on the Red Sea coast, Abu Dhabi is backing local and southern forces to fight the Houthis; in southern Yemen, Abu Dhabi is backing local counter-terror units to fight AQAP. Although note that the base in Berbera is currently under construction. The base has also been used to train Yemeni forces. After Saudi Arabia, the nation spearheading Operation Restoring Hope, the UAE is the second most active actor of the intervention aimed at defeating the Houthis and reinstating the internationally-recognised government of President Abdurabbuh Mansur Hadi (for more on the Saudi-led coalition, see ACLED, 31 July 2018). Initially dubbed Operation Decisive Storm when it was launched on 26 March 2015, the intervention became Operation Restoring Hope on 21 April 2015, officially to shift its focus from “military operations to the political process” (Operation Renewal of Hope, 21 April 2015). Although it has kept the name up until today, not much has been seen of the political process, as the coalition’s focus is still very much on military operations. This was reflected, in early September, by its decision to resume the offensive on Hodeidah, following the failure of renewed UN-led peace talks before they even started (ACLED, 12 September 2018), and despite alarming red signals raised by the humanitarian community about the widespread famine that could result from the closure of the city’s port. Although they fight alongside one another to defeat the Houthis, Abu Dhabi and Riyadh have adopted rather different strategies. On the one hand, Saudi Arabia has been focusing on an intense aerial campaign throughout the country, concentrating its efforts on the group’s strongholds in northwestern Yemen (ACLED, 22 March 2018). Intense clashes have killed a number of Saudi soldiers in the area, as the Houthis have become, in the eyes of Riyadh, an existential security threat at its southern border. On the other hand, the UAE, which has also lost a number of soldiers, has focused on training and funding local forces that oppose the Houthis in southern and western Yemen. Under the National Resistance/Joint Forces umbrella name, these groups have been spearheading the fight against the Houthis along the Red Sea coast. They consist primarily of the Giants Brigade, the Guardians of the Republic and the Tihama Resistance (ACLED, 20 July 2018). Abu Dhabi’s support, however, appears to be lacking a cohesive long-term strategy, as these groups share little beside their common enmity toward the Houthis. These alliances of convenience have consequently imploded a number of times. In late September, the deadliest clashes as of today took place between Tihami fighters and Subayhi tribesmen from the Giants Brigade in the coastal city of Khawkhah (Yemen Press Agency, 22 September 2018; Huna Taiz, 25 September 2018). How these groups will be integrated within the country’s security architecture once the Houthis are defeated is yet unclear. Abu Dhabi’s second mission in Yemen is part of a larger regional strategy that aims at positioning the UAE as the champion of the fight against religious extremism. To this end, it has made Yemen its experimental ground, leading to unprecedented cooperation between Abu Dhabi and Washington. The prime example of this is perhaps a joint ground assault against an alleged AQAP hideout in January 2017 (The Intercept, 9 March 2017). Although the UAE’s fight against AQAP has led to genuine successes, a number of grey areas persist and cloud these important victories. Today, the UAE is the only Gulf country that possesses counter-terror experience, which it acquired during its time in Afghanistan, where Emirati elite forces were present on the ground for 11 years side-by-side with US Special Operations forces (The Washington Post, 9 November 2014). Abu Dhabi has thus formed, trained and equipped a number of counter-terror forces in southern Yemen: the Security Belt forces present in Aden, Lahij and Abyan governorates; the Shabwani Elite Forces present in Shabwah governorate; and the Hadhrami Elite Forces present in Hadramawt governorate (see Figure 3 below). This has led to an undeniable decline in AQAP activity throughout southern Yemen, as militants have been pushed north toward Wadi Hadramawt, and Al Bayda and Marib governorates in central Yemen (see Figure 4 below). The organisation’s ability to both control territory and conduct operations abroad has been considerably weakened (ACLED, 9 August 2018). Moreover, it seems like the UAE has been positively involved in post-conflict stabilisation, which is an all too rare feature of foreign interventionism in the region (The Atlantic, 22 September 2018). In addition to addressing the root causes of individuals joining AQAP, which involves, according to UAE military officials, “improving the general quality of life of the individual, by re-establishing normal societal structures and processes, which improve opportunities for employment, and, it follows, general welfare and happiness”, this has also included integrating former fighters into security forces, after “extensive psychological testing” (The Independent, 16 August 2018). To this end, along with addressing the dire humanitarian situation caused by the conflict, the UAE had reportedly pledged nearly $4 billion to Yemen as of August 2018 (The National, 8 August 2018). A number of analysts, however, argue that the organisation might be ‘sleeping’, or ‘hibernating’, and that the assertion that AQAP is being eradicated should not go unchallenged. Although conflicting narratives exist, reports have for instance emerged of alleged deals between AQAP and the UAE, through which tribal mediation would have led to non-violent transfer of territory between AQAP militants and UAE-backed forces. In perhaps the most famous and controversial case, urban clashes to oust the organisation from the southern port city of Mukalla in April 2016, which the organisation had effectively controlled for a year, were avoided through a deal that allowed AQAP fighters to leave the city with their military hardware and as much as $100 million of looted cash (Associated Press, 07 August 2018). Such reports highlight the contradictions between Abu Dhabi’s two missions in Yemen: hardened AQAP fighters have proven to be crucial elements of the fight against the Houthis, and allowing them to escape southern areas to move north fills the ranks of anti-Houthi forces. According to the Middle East Correspondent for The Independent, Bel Trew, a senior UAE military commander has explained that “the counter al-Qaeda operation will remain and we will remain in Yemen until AQAP is broken. We will stay until it is done” (The Independent, 15 August 2018). As the old adage goes, however, actions speak louder than words, and a number of the UAE’s actions raise doubts about, at least, its ability to successfully eradicate AQAP, and, at worst, its real intentions in Yemen. The words of military commander Brigadier Ali, who claims that Abu Dhabi “will eventually cleanse Yemen of all terror outfits” (The Independent, 15 August 2018), for instance, seem at odds with the UAE’s seemingly unconditional backing of militia leader Abu al Abbas, who was put on the US list of designated terrorists in October 2017 because of his ties to AQAP (US Department of the Treasury, 25 October 2017). Armed groups in Yemen are indeed not monolithic entities, and boundaries between groups are subsequently porous, when they do not overlap. Some Yemenis, for instance, worry that a number of UAE-backed Salafi fighters, which represent perhaps the largest component of the Giants Brigade mentioned previously, will end up joining the ranks of AQAP once the Houthis are defeated, as their ideologies are ultimately entrenched within the same tenets. Moreover, although the counter-terror forces supported by the UAE in southern Yemen are officially part of the command and control structure of the internationally-recognised government of President Hadi, they are virtually the armed wing of the Southern Transitional Council, a secessionist body claiming to represent former South Yemen and asking for independence from the North. If the current conflict has amplified the call for southern independence, it has, at the same time, led to increased competition within South Yemeni politics. While a majority of Yemenis in the South might be united around the Southern cause today, they remain deeply divided, at both grassroots and elite levels, about what the aftermath should look like. If the South were to suddenly become independent, these divisions could very well develop into an all-out conflict. Visiting fellow at the European Council on Foreign Relations Adam Baron has argued that “tensions [in southern Yemen] are among the highest they’ve ever been” and that there is “a real limit to how far things can get kicked down the road” (The Independent, 17 August 2018). While no South-South reconciliation process has taken place after the 1986 civil war, a renewed security breakdown could be exploited by AQAP militants to make their way back to their former safe havens in the region. The discrepancy between the UAE’s stated goals in Yemen and the means it is employing to achieve them thus leads one to wonder about the true nature of its engagement. A careful analysis of the UAE’s actions, however, seems to indicate that it is trying to establish a durable military presence, notably through the creation of local security forces that would be able to secure its interests in the country. Additionally, evidence has emerged showing that Abu Dhabi is already managing a network of secret prisons in the South (Amnesty International, 12 July 2018). The Emirati forces’ statement that they could stay in Yemen after the Houthis are defeated, if this is required by the fight against AQAP, might very well be a way to legitimate, starting now, a long-term presence in the country. This narrative echoes all too well that of the US War on Terror in the region in the 2000s. 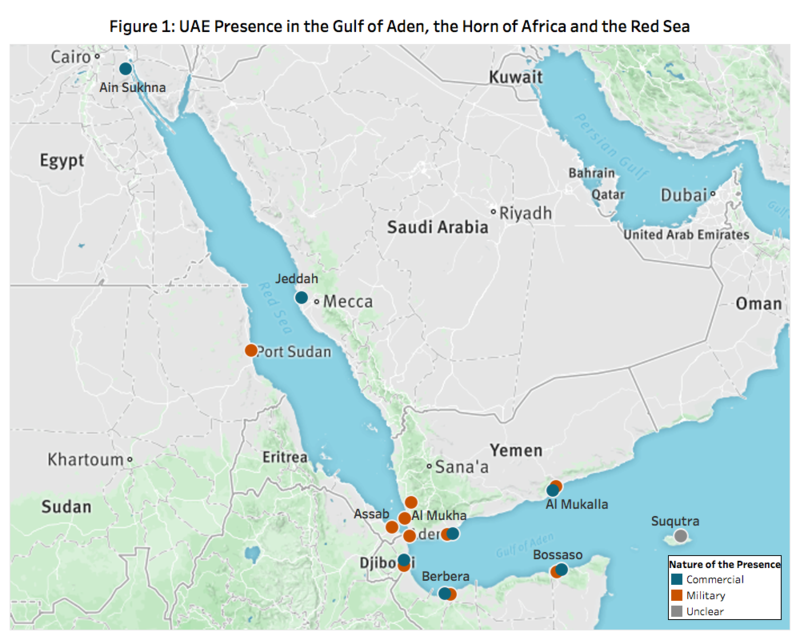 In contrast to the direct military involvement the UAE conducts in Yemen, the UAE’s engagement in East Africa does not include the deployment of troops on the ground and its actions in the area seem to primarily reflect its economic interests. Historically, the UAE has trained and supported soldiers in Somalia who conduct operations against Al-Shabaab, and its military support in the region fell more in line with international efforts to creating stability within the country. Although the UAE has recently played an important role in solving a long-running and economically inhibiting regional conflict between Ethiopia and Eritrea, the Emiratis have lately found themselves caught in several complicated political entanglements that may influence future instability within the region. In June of 2017, the UAE severed diplomatic relations with Qatar, citing links to terrorism, sparking the Gulf Crisis. Somalia’s location on the Red Sea and status as an Arab League member placed it at the centre of negotiations, with both sides in the Qatari conflict persuading the nation to abandon its neutral stance (Critical Threats, 26 September 2017). While the Somali government led by President Farmajo issued a statement insisting on its neutrality, Somalia’s semiautonomous regional governments of Galmudug, Puntland, and Hirshabelle issued statements of support of the UAE in the Gulf Crisis (VOA, 21 September 2018). These actions, emboldened by UAE support, were a mirror of port deals signed by another of Somalia’s semiautonomous regional governments, Somaliland. In a deal between the UAE, Ethiopia and Somaliland, 51% of Berbera Port shares were allotted to the UAE’s DP World, which will manage and develop the port. Tensions over the deal immediately flared, with the Somali government led by Farmajo insisting that only the central government in Mogadishu can sign international agreements (Relief Web, 18 May 2018). With a military base already being built by the Emiratis in Somaliland, the central government likely fears that the UAE will follow previously exhibited patterns and increase its military support of the breakaway region’s military forces, which would strengthen Somaliland’s ability to forcefully assert its claim to independence. These fears were confirmed when President of Somaliland Muse Bihi Abdi said the UAE would train police and military in Somaliland (Goobjog, 16 March 2018). Since 2014 the UAE’s military involvement in East Africa historically aligned with international goals at defeating Al-Shabaab. However, following strained relationships caused by the Gulf Crisis, the Berbera port dispute, and a cash seizure, the UAE cut its support to Somali forces. Notably, this did not include a break in military support for troops the declared autonomous state in Puntland (Garowe Online, 14 April 2018). Additional military action by the Emiratis within the East African Horn includes a number of military bases, most notably in Assab, Eritrea, a strategic location from which Abu Dhabi can train Yemeni troops and launch airstrike attacks against Houthi forces in Yemen. The UAE’s actions in East Africa have not all been divisive. The Emiratis have reportedly played an important role in bringing an end to two decades of conflict fought between Ethiopia and Eritrea (Reuters, 24 July 2018), no doubt incentivised by the economic benefits that will surely come to UAE controlled ports as a result of the deal. Many in the region hope that the Emiratis will likewise be able to calm tensions in the region between Ethiopia and Egypt surrounding the Grand Ethiopian Renaissance Dam project. Furthermore, infrastructure development projects and extensive aid provided by the UAE in East Africa could bring a much-needed economic boost. In June of 2018, the UAE pledged $3 billion in aid and investments to Ethiopia in a show of support for the new Prime Minister Abiy Ahmed (Reuters, 16 June 2018). The UAE’s Growing Military Power: To What End? The UAE has historically engaged on the global stage through the use of soft power. Impressive achievements such as the city of Dubai, which has become an international hub and continues to attract highly-educated individuals from all over the world, and Emirates, which has become one of the world’s leading airlines, have successfully projected the image of a progressive UAE abroad. This strategy had won the hearts and minds of a number of major capitals around the world. The new princes that took over leadership positions within the UAE in 2004, replacing the founding generation of the Federation, however, seem to have decided that this was not enough. The creation of DP World in 2005, which allowed the UAE to acquire a physical footprint across the globe through the operation of more than 70 ports, for instance rings like it is more than just a mere coincidence. Inevitably emboldened by the successes of its soft power, and amid growing economic interests outside of its borders, Abu Dhabi’s increasing military projection abroad appears as the logical next step. This was most likely rendered possible by its initial soft power strategy. Winning the hearts and minds of major global powers has decreased the potential for reluctance on their part at seeing the UAE empower itself. Moreover, within the context of an increased perception of the Iranian threat in Abu Dhabi, the Obama administration’s ‘leadership from behind’ doctrine has further contributed to the Emirati sentiment that it had to take on a military role in the region. The exact nature of the relationship between the UAE’s emerging hard military power and its soft investment power, however, remains yet unclear. Recent actions taken by the small Gulf state could suggest that increasing military power and influence is an end in and of itself, as the UAE seeks to join a growing club of emerging powers in the region seeking to secure commercial interests. The military identity Abu Dhabi is acquiring in the meantime, however, compounded by a sense of immunity provided by the lack of accountability on its actions in Yemen (Human Rights Watch, 29 June 2018), could lead “Little Sparta” to undertake further destabilising actions. Although it is, as of today, highly unlikely, its military encirclement of the Bab al Mandab Strait depicted in Figure 1 could very well be used as a levering tool in the future, not unlike the blackmail sometimes exerted by Tehran over the Strait of Hormuz. Lately, the UAE indeed seems to be increasingly willing to engage itself militarily and diplomatically with actors that are not necessarily linked to internationally-recognised states, ultimately upsetting local and regional orders. While the long-term consequences of its actions in Yemen are yet to be determined, its engagement in the Horn of Africa has already, at times, destabilised the region. As Abu Dhabi is pursuing a goal of establishing long-term military influence beyond the Peninsula, both its military and economic actions, funded by its vast amounts of oil wealth, are certain to influence levels of political violence within the Red Sea littoral communities. Some accounts even report that US Special Operations Forces helped UAE forces to secure a safe passage out of the city for AQAP militants (The New York Times, 1 February 2017). The Republic of Yemen was formed in 1990. Before that, North Yemen was a Zaydi Imamate until becoming the Yemen Arab Republic in 1962; South Yemen was a British protectorate that gained independence in 1967 to form the Marxist People’s Republic of Yemen. Valentin d’Hauthuille is a Middle East researcher with ACLED. In his role, he has coded political violence and protest events in all Gulf countries and is now focusing on Yemen and Saudi Arabia. Valentin is fluent in French and English and has an intermediate level in Arabic.